Prior to his senior roles at Alantra and Abengoa, Vicente was a senior consultant at PwC Financial Risk and Treasury, and prior to that he had 2 years of experience as senior credit officer in different banks including HSBC, BBVA and ING in Switzerland and France. Vicente was Member of the MedGrid Finance Working Group until 2013. 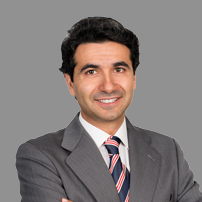 Vicente holds a Bachelor of Finance from the European Business School (London-Paris). Languages ​​(Proficiency Level): Spanish, English and French. Vicente Jorro has been a guest lecturer in finance at McDonough Business School at Georgetown University in Washington DC and at IAG PUC-Rio in.